﻿ EURO 2012 » Camps are being built for the Euro 2012. It will be a paradise for fans! EURO 2012 > Euro 2012 > Camps are being built for the Euro 2012. It will be a paradise for fans! The number of hotels and hostels in Poland is limited, so fans, during the Euro 2012, will live, among others, at student hostels and private houses. It’s not the end of options. 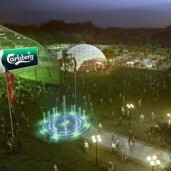 A very interesting offer for football fans is prepared by one of the global sponsors of the tournament – Carlsberg, which will open a modern camps. We heard about plans for creation of such sites in October from Rafał Rosiejak, the national coordinator for the accommodation from the PL 2012 company. 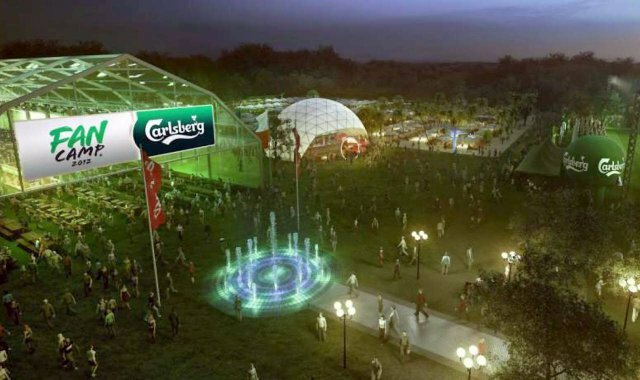 Carlsberg Fan Camps will be built in Warsaw, Wroclaw, Poznan, Gdansk and Krakow, where during the EURO 2012 there will be teams of England, Italy and Holland. ” Indeed, at this moment we conduct talks with the host cities of the Euro 2012 on the establishment of such sites. Will they appear in other cities? We do not know. The details will be announced during the official press conference held in the second half of February” – says Pawełl Rabantek, a representative of the brewing company Carlsberg. He confirms that in each of the camps there will be several thousand beds. The lowest price of accommodation per person in a double tent amounts to 176 PLN per day. The price per night in a single tent amounts to 222 PLN. For additional equipment (pillow, sleeping bag, foam pad) costs 136 PLN. There are also parking spaces, and the price for one space is 50 PLN per day. The cost of dinner amounts to half of the price of the parking space. At what times will the camps be open to fans? ” We plan to open them from the beginning of the championships up to the time in which the Euro 2012 will end in a particular city. In the case of Poznan and Wroclaw the sites will be open during the group phase. As for Gdansk or Warsaw they will be open longer due to quarterfinals and semifinals” – says Paweł Rabantek. According to the plan, submitted at www.carlsbergfancamp.pl, in Wroclaw and Poznan the sites will be open until June 20, in Sopot/Gdansk until June 25, in Warsaw (and in Krakow) until July 2. The minimum stay time for a fan in each of them is two days. An alternative for hotel accommodation will be the Accommodation Area. Organizers write on the project website: “It’s a safe and comfortable rest after football events. Comfort, fresh air and fun with fans from around the world”. Near the Accommodation Area there will be high quality bathrooms and toilets as well as luggage storage area. The site will also include the Fun Zone, Sports Zone and Catering Zone. Fans will be able to benefit from the sandy beach, sports fields and numerous dining points available 24 hours a day. “We plan to organize concerts and various other live performances. What events will actually be organized will depend also on the authorities of the cities. At this stage I can not reveal anything yet” explains Paweł Rabantek. Every day the camps will be open to all fans. Also, for those who have not taken out of their accommodation. “The areas in which concerts, games are held will be open to all. However, the Accommodation Area will be available only to those who purchased a place of accommodation” says the representative of the organizers. Fans who decide to come to the Carlsberg FanCamp can rest assured about the issue of safety. There will be professional security team at this place, who have experience in ensuring safety for such events. We will also work closely with the police – says Rabantek. Reservation can be made now. Cheap accommodation in Warsaw – Poland. I want to invite you to Team Hostel, which is located in Warsaw – Poland. We provide cheap and cosy rooms, wi-fi internet connection and great home-like atmosphere. Team Hostel is located by Lechicka street, no. 23 B.
or send an e-mail: rezerwacje (at) teamhostel.com. Team Hostel is a great choice for accommodation during EURO 2012.